Flotech Tube Services is dedicated to manufacture, repair or re-tube Heat Exchangers, Surface Condensers, Main Condensers, Coolers, Chillers and all types of component heat transfer vessels for heavy industry and marine applications. Not sure what you need, ask us about an on site condenser inspection and estimate. Need replacement heat exchangers or spare tubes? We will cut to your length, debur and ship the same day. Planning a plant outage and need experts in tube repair contact us. Monitoring every project and quality control is extremely important whether in your facility or at our plant. Flotech Tube Services has years of experience delivering high quality tube work and industry standard certifications. 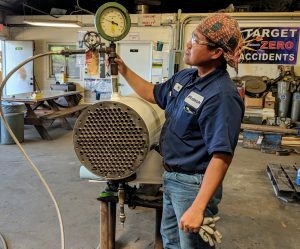 Check out this case study of recent heat exchanger service work performed at our facility for a Georgia based power company.